Please consider the following submission as it relates to the Icebreaker Wind Turbine project as proposed in close proximity to the Burke Lakefront Airport, Cleveland Ohio. When traveling by air, the most dangerous portion of a flight is when the aircraft is closest to, or at, an airport. According to Transport Canada, in Canada, 87% of aircraft accidents happen at or near airports. Needless to say, introducing 500 ft high obstacles within the airspace of any airport poses significant safety risks. Statistically, it is within 15 miles of an airport that aircraft are in the “riskiest” phases of flight and may encounter problems that jeopardize air safety. Transport Canada data indicates that in the decade between 2002 and 2011, there were an average of 357 aircraft accidents per year in Canada and almost half of them occurred during attempted landings. This does not take into consideration incidents that didn’t result in an accident but could have. When an aircraft gets into trouble, it needs to land as soon as possible at the nearest suitable airport. Between 2002 and 2011, according to Transport Canada, there were 5,860 incidents that required pilots to make emergency landings at a Canadian airport. Clearly, the imposition of 500 ft structures with 300 ft diameter whirling blades in the vicinity of an airport would significantly increase the risk of serious accidents. There is growing hard evidence supporting fears that industrial scale wind turbines are a real aviation hazard, and at least some local airport authorities and local jurisdictions are taking action. In the neighboring Province of Ontario, which shares the airspace overhead of this proposed offshore project, a recent ruling in a 2016 ERT hearing (Wiggins vs Ontario Case No 16-036) stated that locating obstacles in the proximity of an aerodrome, or that airspace underutilized by aircraft in flight, will cause irreversible harm to human health. ‘Municipal planners and developers must understand that how land is used around an aerodrome will have an impact on the aerodrome’s operations. The land use around aerodromes can have significant impacts on safety at the aerodrome and can negatively impact the operational viability of the aerodrome to the detriment of the local community that depends upon it. Note: It is of the utmost importance to be aware that the proximity of obstacles, for example wind turbines, telecommunications towers, antennae, smoke stakes, etc., may potentially have an impact on the current and future usability of an aerodrome. Expert witnesses provided testimony, supported by statistical studies, as to the effect of wind turbine turbulence. This is an area of expertise that is undergoing much study with the introduction of wind energy in North America. All experts agree that wind turbulence is created in the turbines’ wake but the effects are unknown, however, when compared to aircraft or helicopter wake turbulence, turbine turbulence will be catastrophic if encountered by an aircraft in flight. A study, entitled Wind Farms Turbulence Impacts on General Aviation, released January 18, 2014, by University of Kansas researcher, Prof. Tom Mulinazzi, finds that wind turbines could be hazardous for small aircraft. The study was done for the Kansas Department of Transportation. According to Mulinazzi, wind turbines can set up a circular vortex that can roll a plane if it gets caught in it. A second problem, Mulinazzi says, is that wind turbines can increase crosswind speeds above what’s expected, which can be a real danger to small aircraft, which don’t typically take off and land with crosswinds stronger than about 20 km per hour. The study was commissioned after the Kansas Transportation Department’s aviation division started receiving a large number of reports from pilots complaining that they were experiencing unusual turbulence as they flew near wind farms. Mulinazzi and his team found that the higher the wind speed, the farther the turbulence reached – stretching almost 5 km from a single turbine – before dissipating. Even before release of the Mulinazzi study, a coalition of pilots using the airport in Pratt, Kansas, had petitioned against plans for a wind farm to be built within 5 km of the airport runway. Part of their objection was the possibility the turbines would create winds causing dangerous turbulence. Mulinazzi’s team looked at the pilots’ concerns at Pratt and another airport 8 km south of Stockton, Kansas. Researchers concluded that at both airports, pilots could potentially encounter a crosswind or “roll upset” generated from a wind turbine. Subsequently, according to Reid Bell, manager at the Pratt Airport, the Pratt wind farm project was relocated farther away from the airport. In addition, city officials approved an ordinance protecting airspace around the airport from any future wind farm hazard. surface of the lake to maintain visual contact with the ground enabling them to safely land at Burke field. Wind turbines masked by the back drop of cloud and water will most certainly be cause for a pilot to be unable to avoid the obstacle in time once it becomes visible. Human factors are one of the most common, leading causes in aviation accidents. Pilot Error is to be human. Humans still operate aircraft in an environment of ‘see and avoid’ or ‘navigate and avoid’. It is proven that when a pilot operates in close proximity to obstacles the flight risk of controlled flight into terrain goes up exponentially. Burke lakefront airport is virtually free of this added obstacle flight risk. Again, I reference TP 1274E. The land use around aerodromes can have significant impacts on safety at the aerodrome and can negatively impact the operational viability of the aerodrome to the detriment of the local community that depends upon it. The aviation community recognizes that it is prone to deviations from published procedures on occasion. This is why the U.S.A. Department of Transport factors in deviation errors when designing flight procedures. An aircraft in flight cannot be brought to a stop or reversed so as to adjust its flight trajectory. The introduction of obstacles only goes to narrow the deviation protection of error to the point that the risk of collision is imminent, should the smallest of deviation occur due to factors beyond a flight crews’ control or awareness. Cleveland and the surrounding area depends on the Burke Lakefront Airport. Likewise, this community relies on the State of Ohio to adopt appropriate protocol in protecting public safety, and proven safe operating transportation infrastructure, when engaging in renewable energy projects. I urge you to act in the public interest in protecting your community, preserving aviation safety and preventing harm to human health by not approving wind turbines within a 15 NM radius of the Burke Lakefront Airport. On February 11, 2016, Mohsen Keyvani, Director, Ministry of the Environment and Climate Change (“MOECC”) issued Renewable Energy Approval No. 39489RDLRF (the “REA”) to wpd Fairview Wind Incorporated (the “Approval Holder”), granting approval for the construction, installation, operation, use and retiring of a Class 4 wind facility with eight wind turbines and a total name plate capacity of 16.4 megawatts (the “Project”). The Project is proposed to be located in Clearview Township, Simcoe County, Ontario (the “Project site”). Environmental Protection Act (“EPA”). Each Appellant appealed on the grounds that the Project will cause serious harm to human health and serious and irreversible harm to plant life, animal life and the natural environment. In overview, respecting harm to human health, it is the Appellants’ position that the proposed location of the wind turbines, which are in close proximity to the takeoff and landing areas of two aerodromes, the Collingwood Regional Airport (“CRA”) and Clearview Field, Stayner (“Clearview”), will result in airplane accidents that will result in serious injury or death. The Director and the Approval Holder disagree. Respecting serious and irreversible harm to animal life, the Appellants take the position that the proposed wind turbines in the Project will result in collision mortalities for hibernating bat species, including little brown myotis (Myotis lucifugus), northern myotis (Myotis septentrionalis), and eastern small-footed myotis (Myotis leibii), which are all listed as endangered under the Endangered Species Act, 2007 (“ESA”). The Appellants maintain that such collision mortalities will further accelerate the decline of these species’ populations, and further reduce their numbers in the vicinity of the Project site leading to local extirpation. Again, the Director and the Approval Holder disagree. The parties completed the presentation of their evidence in the main hearing on June 3, 2016. The Tribunal subsequently issued an Order, dated June 16, 2016, adjourning the proceeding for 64 days under O. Reg. 359/09, s. 59(2)1.ii. In light of this adjournment, under s. 145.2.1(6) of the EPA the due date for disposing of this hearing was revised to October 21, 2016. For the reasons that follow, the Tribunal finds that the Appellants have satisfied the health and environment tests under s. 145.2.1(2)(a) and (b) of the EPA and further adjourns this hearing under O. Reg. 359/09, s. 59(2)1.ii to determine the next steps in this proceeding. (b) serious and irreversible harm to plant life, animal life or the natural environment. … Hearing required under s. 142.1 145.2.1 (1) This section applies to a hearing required under section 142.1. What Tribunal must consider (2) The Tribunal shall review the decision of the Director and shall consider only whether engaging in the renewable energy project in accordance with the renewable energy approval will cause, (a) serious harm to human health; or (b) serious and irreversible harm to plant life, animal life or the natural environment. Onus of proof (3) The person who required the hearing has the onus of proving that engaging in the renewable energy project in accordance with the renewable energy approval will cause harm referred to in clause (2) (a) or (b). Powers of Tribunal (4) If the Tribunal determines that engaging in the renewable energy project in accordance with the renewable energy approval will cause harm referred to in clause (2) (a) or (b), the Tribunal may, (a) revoke the decision of the Director; (b) by order direct the Director to take such action as the Tribunal considers the Director should take in accordance with this Act and the regulations; or (c) alter the decision of the Director, and, for that purpose, the Tribunal may substitute its opinion for that of the Director. Same (5) The Tribunal shall confirm the decision of the Director if the Tribunal determines that engaging in the renewable energy project in accordance with the renewable energy approval will not cause harm described in clause (2) (a) or (b). Deemed confirmation of decision (6) The decision of the Director shall be deemed to be confirmed by the Tribunal if the Tribunal has not disposed of the hearing in respect of the decision within the period of time prescribed by the regulations. 1. Whether engaging in the Project in accordance with the REA will cause serious harm to human health; and 2. Whether engaging in the Project in accordance with the REA will cause serious and irreversible harm to bats. The Tribunal has considered all the evidence and submissions of the parties in detail. As these written materials exceed 2,000 pages, the Tribunal has reproduced only the evidence and salient submissions necessary to explain the Tribunal’s reasons for its disposition of these appeals.  Adam Dershowitz, who was qualified to give opinion evidence as an expert in aeronautical engineering, including aviation risk and pilot decision-making.  Keith Green, who was qualified to give opinion evidence as an expert in Aviation Safety Management Systems (SMS), inclusive of Hazard and Risk Assessment, and aerodrome/airport safety.  Randy Mawson, who was qualified to give opinion evidence in the area of forensic climatology, including the impacts on aviation and aircraft.  Conrad Hatcher, who was qualified to give opinion evidence as an aviation expert and, more specifically, as an expert in civil aviation as it relates to pilot training, aircraft operations and general aviation safety, including the conduct of safe operations in the aerodrome environment.  Anthony Cox, who was qualified to give opinion evidence as an expert in the area of risk assessment in public safety, energy and transport as well as fluid dynamics and turbulence.  David Simpson, who was qualified to give opinion evidence as an expert in instrument flight procedure design and instrument flight procedure maintenance for aerodromes, airports and en route structures. The federal government regulates aviation under the Aeronautics Act and the Canadian Aviation Regulations (“CARS”). These are administered by Transport Canada which is a federal government department. NAV CANADA is a federally incorporated corporation that provides air navigation services in Canada, pursuant to the Civil Air Navigation Services Commercialization Act. Pursuant to this Act, NAV CANADA provides air navigation services in Canada, including aeronautical information, air traffic control, aviation weather reporting, and flight information to pilots. Transport Canada publishes standards, and, as well, issues guidance documents. These include documents on land use in the vicinity of aerodromes (for example, TP1247E – “Aviation – Land Use in the Vicinity of Aerodromes” (“TP1247E”)) and standards and recommended practices (for example, TP312 – Aerodrome Standards and Recommended Practices (“TP312”)). NAV CANADA also publishes the Canada Flight Supplement, which is an aerodrome directory that provides data and sketches of Canadian aerodromes and airports. Under the federal regime, an aerodrome is any location where planes take off or land. Aerodromes may be registered with Transport Canada, but are not required to be. However, all aerodromes must comply with CARS, Part III Subpart 1. Registered aerodromes are included in the Canada Flight Supplement. These standards complement subpart 302 of the Canadian Aviation Regulations (CARs). They set out requirements such as: physical characteristics, obstacle limitation surfaces, visual aids and technical services the aerodrome operator at a certified land aerodrome (airport) provides to support aircraft operations. Other standards, established under Part III of the CARS form part of the overall safety specifications to satisfy the requirements of aerodrome certification. The operational requirements for an airport are therefore more stringent than those for an uncertified aerodrome. Until 2007, the CRA held airport certification, but then relinquished this designation. Although it is still named the Collingwood Regional Airport (emphasis added), the CRA has, since then, continued to operate only as an uncertified aerodrome. Clearview has never been certified. Neither CRA nor Clearview have an air traffic control service. They each have uncontrolled airspace. Municipal planners and developers must understand that how land is used around an aerodrome will have an impact on the aerodrome’s operations. The land use around aerodromes can have significant impacts on safety at the aerodrome and can negatively impact the operational viability of the aerodrome to the detriment of the local community that depends upon it. However, TP1247E does not make any specific recommendations regarding the placement of wind turbines in proximity to aerodromes. In summary, all airports are aerodromes, but not all aerodromes are airports. Under the CARS, airports must comply with TP312, but aerodromes do not. Nonetheless, implementing TP312’s requirements is considered a best practice to promote air navigation safety at an aerodrome. CRA, when it was an airport, complied with these requirements, and, based on the evidence before the Tribunal, it continues to do so. Pilots may operate their aircraft under Visual Flight Rules (VFR) or Instrument Flight Rules. Most recreational pilots fly VFR only, which requires reasonable weather conditions, visual reference to the ground, and adherence to the principle of see-and-be-seen. VFR pilots must avoid clouds and maintain a safe height above ground unless taking off or landing. IFR pilots require more training, must pass an annual test, and have more instruments and navigational aids in their aircraft. They can fly on their instruments in almost any weather, do not need reference to ground, and require a clearance from the air traffic control agency. Visual departure/approach: the pilot departs/approaches by visual reference alone in conditions where the pilot’s field of vision is not obstructed by clouds or other inclement weather. Pilots who take-off and land visually are not required to have an instrument rating. Instrument departure/approach procedure: this is an airport or aerodrome procedure, approved by NAV CANADA used in inclement weather to support visual take-off or landing. Instrument approaches allow a pilot to use aircraft instrumentation to guide the aircraft through non-visual means to a position from which the aircraft can either be visually landed safely or a missed approach performed if the pilot cannot see the runway adequately to execute a normal landing. An instrument approach or departure procedure cannot be used by a pilot who does not have an instrument rating. In addition, many aerodromes do not have approved instrument procedures, meaning take-off and landing may only be accomplished visually. (b) where the aircraft is an aeroplane, during the day, at less than 500 feet AGL [above ground level] or at a horizontal distance of less than 500 feet from any obstacle. Consequently, pilots flying under VFR must not only maintain visual contact with other planes flying at the same altitude, but also with planes or other obstacles below and above them. A plane’s forward velocity is provided by either motor-driven propellers, typically employed by smaller aircraft, or by jet engines, usually in larger aircraft. This forward velocity creates movement of air over the front of the plane’s wings, which, in turn, creates the air pressure dynamic which lifts the plane into the air. Standard flight practice recommends that planes take off into the wind, i.e. travel in the opposite direction that the wind is blowing (also described as a headwind). The headwind blowing over the wings creates additional lift. This means that, in order to achieve the lift necessary to become airborne, a plane travelling into the headwind can travel at a lower ground velocity, which, in turn, requires a shorter takeoff run for the plane to become airborne. It is trite to observe that, unlike automobiles, there is no reverse gear in a plane. In order for a plane to take-off and remain aloft, the plane must achieve and maintain a minimum forward velocity. The air must flow evenly over the wings to maintain lift. However, the angle in which a plane travels through the air can reach a critical point, where, aerodynamically, the wings no longer provide sufficient lift, resulting in aerodynamic stall, where a pilot would lose control of the plane and it would begin to fall. A pilot may be able to maneuver the plane to re-establish control of the plane if an aerodynamic stall occurs. It must be noted that aerodynamic stall is different from engine stall. In the case of an engine stall, the plane can continue to glide, and, hopefully, a pilot would be able to maneuver the plane in order to land safely. would impact with the ground. It is also important to remember that a plane maintains forward velocity during the time required to complete a turn, so, during a turn, a plane continues to travel a horizontal distance as measured in relation to the ground. The velocity at which a plane must fly in order to maintain lift, depends on the size and type of plane. In the air industry, a plane is described as falling within one of four categories (A through D) based on the range of velocity at which it can travel. Smaller planes, which include those generally used for recreational purposes, are grouped in either Category A or B, and the largest planes, such as passenger jets, are grouped in Category D.
 Although obvious, it is important to emphasize that planes travel in 3-dimensional space. As previously noted, under the CARS, the obstacle limitation surface consists of a transitional surface, a take-off surface, and an approach surface. The Takeoff/Approach Surface zones, indicate the range of 3-dimensional space in which a plane would be expected to be located when taking off or landing. These zones are depicted in the following diagram. It should be noted that this zone is wider than the actual runway. Transport Canada has indicated that, although an aerodrome, which is not an airport, does not have to comply with the obstacle limitation surfaces identified in TP312, the operational integrity is enhanced if the designation of the use of land adjacent to the aerodrome is done in line with the technical portions of the standards. For pilots flying under IFR, an aerodrome operator is required to prepare an instrument flight plan which provides pilots with precise instructions for landing or takeoff. Such plans must be submitted to and approved by NAV CANADA before they can be published for use by pilots. unit. So, on any given day, the prevailing winds will determine which direction on the runway a plane will travel. In order to identify runway directions, it is protocol to give a runway two identification numbers. For example, at CRA, one end of the paved runway is assigned the number 13, and the other end is 31. At Clearview, the runway numbers are 16 and 34. There is a standardized method for determining the numbers for any runway based on the direction of the runway in relation to compass direction of true North. turn again onto the Final Leg, where the plane will make its final descent onto the runway. In terms of altitude, a plane that is taking off from the runway is expected to climb to an altitude of 500 feet above the ground by the time it turns onto the Crosswind Leg, and to climb to 1,000 feet by the time it turns onto the Downwind Leg. A plane that is landing joins the Downwind Leg at 1,000 feet above ground. Once it turns onto the Base Leg, the plane is expected to descend to 500 feet, before turning onto the Final Leg to approach and land on the runway. However, it must be remembered that pilots flying under VFR rules are required to fly below the cloud ceiling in order to comply with the requirement that they maintain visual contact with the runway. Consequently, where the cloud ceiling is low, a pilot may be required to fly at less than 1000 feet above ground. and clear the runway before the subject aircraft turns onto the final leg to land. This can also occur if there are aircraft with differing speeds in the circuit. Any and all such adjustments must be made on the spot, while maintaining visual contact with the other aircraft in the circuit, ensuring the aircraft is properly configured for such low speed and low altitude flight, paying particular attention to airspeed to avoid a stall and maintaining circuit height, with appropriate radio calls on the common frequency, all adding to the workload of the pilot. Just how much an aircraft under distress, or due to severe weather, will stray from the centreline depends almost entirely on the skill of the pilot. Commercial pilots practice engine failures on take-off and during goarounds during almost every simulator session. While most pilots can stay within 10 degrees I have seen some ugly situations where pilots have drifted 30 degrees or more. Unlike commercial pilots, however, recreational pilots do not undergo that level of emergency training. Straying from the centre line is more common for recreational pilots, and the distance they stray will be exacerbated by weather, turbulence, and even cockpit distraction. As the above diagram demonstrates, a left-hand circuit pattern will situate the circuit path to one side of the runway or the other, depending on the direction that a plane travels on the runway. The same observation applies if a right-hand circuit pattern is used. Several of the proposed wind turbines are located south of the CRA’s paved runway in close proximity to the circuit path (right- or left-handed). The proposed locations of the wind turbines are described in greater detail below. Consequently, it is of considerable importance to note that, irrespective of whether a left- or right-hand circuit pattern is adopted, planes would be required to fly the circuit pattern to the south of CRA’s main runway. The only way to avoid this situation would be for CRA to require pilots to fly a right-hand circuit pattern when travelling Runway (“RN”) 31/13, and a lefthand circuit pattern when travelling RN13/31. 602.96 (1) This section applies to persons operating VFR or IFR aircraft at or in the vicinity of an uncontrolled or controlled aerodrome. (b) the aerodrome is suitable for the intended operation. (g) where the aerodrome is a controlled aerodrome, obtain from the appropriate air traffic control unit, either by radio communication or by visual signal, clearance to taxi, take off from or land at the aerodrome. Minister of Transportation. In Canada, approximately 3 to 4 per cent of aerodromes have received approval for a right-hand circuit. Where a right-hand circuit applies, it is a pilot’s responsibility to be familiar with this and other flight information as required under Part 607.71 of the CARS. Thus, if the pilot in command is in the left side of the aircraft, he or she will have the best view of the position of the aircraft relative the runway (upon which the circuit is based) as well as the best view to ensure there are no other aircraft in the area into which the aircraft is about to turn. The better view of the runway out the left side also allows the pilot to more easily fly a straight and properly positioned circuit, ensure that no other aircraft, personnel, equipment or wildlife have entered onto the runway and also allows the pilot to more accurately judge a turn to the base leg which is important to properly set up the final leg and thus, the rate of descent for the final leg as well as being able to quickly spot the runway for an emergency descent in the event of an engine failure so close to the ground. A pilot sitting in the left seat of the plane and looking out the left window also has a better view of objects in the sky above and below the plane. However, as Mr. Hatcher points out, a right-hand circuit is not unsafe per se. As he stated in his witness statement, it is simply less safe than a left-hand circuit, because the pilot may have partially obstructed views when looking out the windows of the aircraft. Witnesses for the Appellants also emphasized that right-hand circuits are rare, so they caution against introducing a right-hand circuit at either CRA or Clearview. They acknowledge that pilots, in advance of their departure, are required to familiarize themselves with the landing protocol of their destination airports. However, they caution that, due to human error, some pilots may not do so, simply assuming that a standard left-hand circuit applies. It is not disputed that, if a pilot erroneously adopted a left-hand circuit approach where a right-hand is required, such a situation would create the potential for a mid-air collision. Mr. McDonald, who testified for the Approval Holder, emphasizes that, under VFR, it is the responsibility of the pilot to avoid obstacles and fly the plane in accordance with an aerodrome’s designated circuit pattern. He points out that, in the Royal Canadian Air Force, student pilots are taught how to fly right-hand circuits, and such circuits are flown about 50 per cent of the time. He also points to other airports that use both left- and right-hand circuits on their runways. As is discussed in greater detail below, Mr. McDonald suggests that a right-hand circuit could be implemented at both the CRA and Clearview, if required, in order to mitigate any obstacle safety concerns posed by the proposed Project’s wind turbines. In a letter dated November 17, 2014, a Transport Canada representative, replied to earlier correspondence from the MOECC requesting information in respect of the Project (the “Transport Canada Letter”). In this letter, Transport Canada notes that a right-hand circuit is one of the ways to mitigate the impact of obstacles that lie within the circuit pattern for both CRA and Clearview, noting that an aerodrome operator could request Transport Canada to approve a right-hand circuit for these runways. However, in this letter, Transport Canada does not indicate its approval of a right-hand circuit for either of these runways. No other evidence was adduced in these proceedings to indicate that a right-hand circuit would be approved by the Minister of Transportation, as required under Part 602.96 of the CARS. when the aircraft descends, the outside air pressure increases, which the altimeter detects and displays, not as an increase in air pressure, but a decrease in aircraft altitude. … small variances between the proper altimeter setting at the destination aerodrome and the last altimeter setting available to the pilot en route become important when descending to land. This is especially true when operating in conditions of reduced visibility and/or at night. Mr. Hatcher also explained that altimeters have a margin of error based on two variables that commonly occur. First, for VFR, Mr. Hatcher explained that an altimeter is not considered to be defective until an altimeter error exceeds 200 feet. Secondly, pilots do not always fly at the required altitude as they attend to navigating a plane. Mr. Hatcher notes that, on a private pilot’s exam, a pilot is allowed to deviate plus or minus 100 feet from a given altitude, and still be considered to have passed the skill demonstration. Rather than turbulence intensity, the greatest hazard to aircraft is the changes to the mean flow in the wake itself. The wind turbine creates both a change in the axial windspeed and would be expected to impart some rotational velocity to the flow due to the drag of the blades. … An aircraft flying more parallel to the wake would encounter a wind shear and a rotation due to the swirl in the wake. …do not have the mass nor energy to easily penetrate rough air or turbulence. In flight at higher speed and altitude this risk can be more safely mitigated, but near the ground in landing and take-off phases these risks are not easily mitigated. 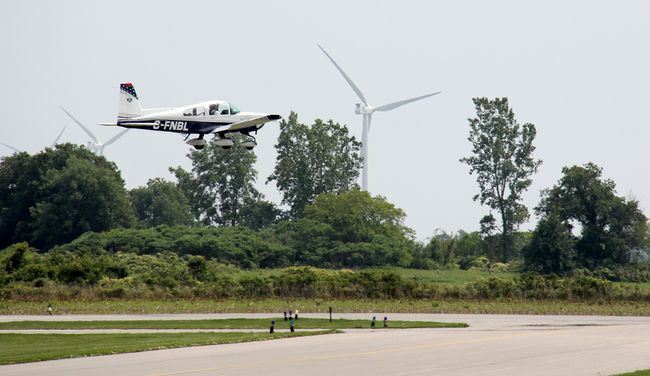 There is disagreement among the experts as to the distance from the wind turbine where turbulence generated by the wind turbine blades no longer poses a navigational hazard for a pilot. Some maintain that the distance is ten rotor diameters or more. However, there is, at least, agreement that wind turbulence is a concern at a distance up to five rotor diameters (462.5 metres) from the turbine blades. The CRA and nearby Clearview are located close to the shores of Georgian Bay, which impacts local weather conditions. Mr. Mawson, a climatologist, provided evidence regarding common weather conditions in this region for winter and summer. length-wise. Consequently, automobile drivers or pilots can encounter a dangerous snow squall, only to find that the weather may suddenly clear. This is particularly true when the driver or pilot traverses a snow squall perpendicular to the length of the streamer. Radar can identify such streamers once they are formed, but cannot be used to predict when they will specifically occur, or where they may meander once formed. Snow squalls can develop quickly if wind speeds and/or directions increase or change unexpectedly. This is especially common in areas such as the southern Georgian Bay region as a result of the proximity to the Bay. Another winter condition mentioned by Mr. Mawson is freezing rain. Annually, Collingwood receives approximately 14 hours of freezing rain over five freezing rain days. Freezing rain is a challenging meteorological phenomenon to forecast. Often freezing rain may form in a narrow band between an area of snow and rain. The extent of the freezing rain may not be well delineated. In some cases, it may not develop at all, and in other cases it may catch forecasters and pilots by surprise. Freezing rain can create ice on a plane’s wings, altering the aerodynamic performance of the plane, resulting in the plane’s speed and thrust decreasing, while weight and drag increases. Pilots faced with aircraft icing as a result of freezing rain are required to make decisions quickly to avoid a build-up of ice on the wings, tail and fuselage. In order to dissipate icing, pilots are often required to change altitude up or down to find warmer temperatures. Regarding summer weather, Mr. Mawson referred to pulse thunderstorms triggered by lake breezes, noting that Collingwood receives approximately 28 thunderstorm days per year. He explained that pulse thunderstorms form randomly, are rarely severe and are highly unpredictable. The features of this type of thunderstorm includes heavy rain, strong downburst winds, small hail and tornadoes. Downburst winds are a concern as they can force a plane to quickly lose altitude. 602.72 The pilot-in-command of an aircraft shall, before commencing a flight, be familiar with the available weather information that is appropriate to the intended flight. Pilot behaviour is an important consideration to take into account when addressing safety at an aerodrome. Human factors that may affect a pilot’s decisionmaking while inflight are critical. These include the pilot’s workload when in-flight, biases, and mental, emotional or physical state. Mr. Cormier noted that pilot error is normal and any pilot may make numerous errors on any one flight. Citing data compiled by NASA, Messrs. Duncan and Hutton stated that high workload is a contributing factor in 80% of aviation accidents. They testified that workload increases in proportion to distraction and a pilot’s competence and training and that increasing the challenges placed before a pilot escalates the potential for an accident. Mr. Hatcher testified that the approach, circuit and landing phases are the highest workload phases of a flight. He stated that during these phases, a plane is most vulnerable as it is at its lowest energy state and is low to the ground, making recovery from unexpected events often challenging. The skill and experience of the pilot are important considerations. Mr. Gascoine stated that itinerant pilots, inexperienced pilots, and pilots who are unfamiliar with the CRA often fail to follow standard procedures when approaching, circuiting or landing at the aerodrome. He stated they at times fly in on the wrong radio frequency, join the circuit incorrectly and/or fly using outdated information. Mr. McKechnie stated that the cumulative effect of multiple hazards and threats, including bad weather, turbulence, obstacles, mechanical issues, fuel concerns, medical issues and others can overwhelm a pilot leading him or her to make poor decisions. Mr. Duncan added that fear that may occur when a pilot is startled by an unexpected event can cause him or her to become overwhelmed. Mr. McKechnie described pilot biases that may lead to poor in-flight decisionmaking by pilots. He stated that pilots are often prone to be reluctant to change their flight plans when they encounter unsafe conditions in order to maintain the respect of other pilots, their passengers or their employers. He said that biases such as this create a false sense of security that may lead to unsafe aviation practices. The mental, emotional or physical state of the pilot can also be factors leading to poor in-flight decision-making. Mr. Duncan stated that fatigue, fear and other factors can cause a pilot to become overwhelmed quickly. … there’s a substantial risk and I think it’s an unacceptable risk by putting those wind turbines in exactly where they are. I think that’s the worst possible position that they could be in with respect to the Collingwood Airport. You’re asking pilots to be perfect, and as Mr. Gascoine said today, pilots are not perfect. And I know I’m not perfect. I’ve made all the mistakes and I’m going to make a heck of a lot more mistakes in my career. So pilots are definitely not perfect. By putting those wind turbines there, you’re asking them to be pretty darn close to being perfect, and I just think that’s it an unacceptable risk, it’s a significant risk. The CRA has a 5,000 foot long paved runway, oriented north-west by southeast. RN 13/31 indicates the direction of the runway pointing eastward, while RN 31/13 indicates the direction pointing westward. CRA also has a 2,450 foot unpaved runway oriented north/south which is infrequently used. In addition to the runways, CRA also has a dedicated terminal building and a range of ancillary facilities including 38 private aircraft hangars. It is capable of accommodating various types of corporate jet aircraft as well as many smaller general aviation aircraft. accordance with the requirements set out in the CARS, utilizing best practices and their training. The CRA is one of the busiest municipal/general aviation airports in Southern Ontario. As of 2011, the CRA recorded approximately 12,000 “movements” per year during business hours, i.e. either a take-off or a landing. Mr. Lajoie, the CRA manager, estimates that there were an additional 1,200 movements occurring outside of business hours. He also noted that the number of movements continues to increase, year by year, making the uncertified CRA busier than many certified airports. The types of pilots using the CRA are comprised of individuals from a range of backgrounds: private recreational, corporate, military, Med Evac, Ontario Provincial Police, Ministry of Natural Resources and Forestry, Ontario Hydro, Royal Canadian Mounted Police (RCMP), Coast Guard, and staff and students involved in flight training from the two flight schools located at the CRA. The CRA is also a popular location for flight training by flight schools based in other airports in Southern Ontario located within 30 minutes flying time. The CRA receives almost daily flights from these schools. Cross-country flights are mandatory for pilot license training, and many aircraft arriving at CRA are solo flights, without an instructor. There are approximately 95 aircraft based at the CRA full time. Only 30% of movements are local (i.e. a plane departs from and returns to the CRA). Approximately 70% of the movements at CRA are conducted by planes arriving from or departing to other aerodromes or airports located anywhere in Canada, the United States, or Bermuda. In 2014, 90 per cent of the takeoffs and landings were conducted by aircraft weighing 2,000 kilograms or less, which typically fall in Categories A or B in terms of speed, and close to 30 per cent of this activity is conducted by flight training students. The vast majority of takeoffs and landings (approximately 90 per cent) are conducted under VFR. Most of the pilots that land at CRA are recreational pilots, travelling from other regional airports either for tourism purposes, commuting between urban centres, or logging training or certification hours. These pilots generally do not have sophisticated Global Positioning Systems (“GPS”) in their planes, nor do they generally have early warning/collision avoidance technology. Some do not have even communication radios on board. The remaining 10 per cent of takeoff and landings are flights conducted under IFR. IFR is utilized by some recreational pilots and pilots flying corporate and charter jets. IFR is also utilized by Emergency Medical Services and military (Department of National Defence) Med Evac jets that are returning sick tourists, and military Search and Rescue. Clearview was registered with Transport Canada in 2011 as an aerodrome. It is located a few kilometres south of the CRA. It has one 1,953 foot grass runway located on land privately owned by Mr. Elwood, who is one of the Appellants in this proceeding. As previously noted, airspace at Clearview is uncontrolled. As a registered aerodrome, the Clearview runway is open to the public. Mr. Elwood estimates that, on average, there are 400 takeoffs and 400 landings per year at the strip. It is used year-round as a destination and a departure point for local pilots and for Mr. Elwood and his sons. When there is snow, the runway is principally used for flight training on skis. Clearview Field provides an operating environment where new pilots can develop sound pilot making decision [sic] skills as the aerodrome requires consideration of all operating conditions to ensure a safe completion of each flight. This is important when a pilot transitions into piloting aircraft unsupervised or in an off airport environment such as float flying and bush flying. Local flight instructors in the area use Clearview Field as a training environment for emergencies and short field decision making. As previously noted, the CRA and Clearview are uncontrolled airspaces, which means that they do not provide communications from an air traffic control tower or control unit. Under the federal aviation regime, certain geographic areas have a mandatory radio frequency service which could provide radio-equipped aircraft with some information to assist an approaching pilot, either directly on the field or remotely from a monitoring location. However, neither the CRA nor Clearview are located in one of these areas. The CRA has does have a radio transmission service that broadcasts on a specified universal communication frequency (described as a “Unicom”). If they have a radio, all pilots within five nautical miles and flying at 3,700 feet above sea level or below are expected to tune into this Unicom frequency to broadcast their intentions to other aircraft in the area and to monitor the broadcasts of other aircraft in the area. The Unicom is at times monitored from the ground by CRA staff who may, if present, respond to an approaching pilot who requests information. Typical information provided to an approaching aircraft on a Unicom includes identification of the active runway and wind strength and speed, if that information is available. However, there is no requirement that the Unicom actually be operated by anyone at the CRA, and no requirement that someone operating the Unicom have proper training to provide information. velocity and direction, Humidex, relative humidity, dew point, atmospheric pressure, and visibility. This data is published on the Internet and is accessible by the public. As Environment Canada does not operate a weather station at Collingwood, pilots must refer to the nearest weather stations located at Canadian Forces Base Borden, Wiarton, or Muskoka. The Appellants state however that local weather conditions at these stations often differ from those at Collingwood. As a small aerodrome, Clearview does not provide any weather reporting services. Pilots using the Clearview runway may communicate via the Unicom as described above. NAV CANADA’s Canada Flight Supplement, which provides information on airports and registered aerodromes in Canada, identifies Mr. Elwood as the aerodrome operator, and provides his telephone contact information. Pilot licences are issued and regulated by Transport Canada. Flight training includes three main components: training where the student pilots a plane under the supervision of the flight trainer; classroom training, which may include computer flight simulator training; and a written examination and flight test. There are several types of licences, including: private, commercial, and recreational pilot licence. Most of the flight traffic at the CRA is conducted by pilots holding either a recreational pilot’s licence or private pilot licence. To obtain a recreational pilot’s licence, the student pilot is required to complete 25 hours of in-flight training, pass a written test (minimum 60%), and pass a flight test conducted by an approved Transport Canada examiner. A pilot holding a recreation pilot’s licence is restricted to flying aircraft with four seats or less, and may carry only one passenger. The recreational pilot is permitted to fly under VFR, but not IFR. extensive experience in all aspects of aircraft handling, emergency procedures, radio procedures, navigation and basic instrument handling. The private student pilot must also complete 45 hours of classroom training, and then is tested by a Transport Canada examiner. The CRA is a popular location for flight training by flight schools based in other airports in Southern Ontario. There are very few large obstacles compared to metropolitan areas like Toronto, Markham, etc. With fewer obstacles, the stress associated with learning to take-off, learning to land, or practicing a missed approach is lessened. At approximately 30 minutes flying time from the Toronto area, the CRA is a good travelling distance from other Regional Airports for training flights, and we receive a large number of training pilots from across the region during mandatory cross country training flights. The CRA is also a tourist destination airport for many licensed pilots from as far away as Ottawa and Sarnia. rotating blades. The rotor diameter is 92.5 metres (303 feet). Therefore, five rotor diameters is 462 metres (1,517 feet). The evidence adduced in this proceeding reports altitude in feet, so vertical height or altitude is measured in feet, while horizontal distances are measured in metres. The proposed locations of the Project’s eight wind turbines in relation to the CRA and Clearview are best described visually. The Tribunal has used black and white copies of colour maps adduced into evidence. Attached to this Order as Appendix 2 is a map showing the proposed location of turbines 1, 3, 4, 5, 6, and 8 in relation to the CRA’s main paved runway and the notional centreline of a standard left-hand circuit. Attached to this Order as Appendix 3, is a map of proposed location of turbines 1, 2, 3, 4, 5, 6 and 7 in relation to the Clearview runway and takeoff and landing zones. This particular map also depicts the five diameter turbulence zone around each turbine. Both of these maps confirm that the proposed locations of the wind turbines are in close proximity to the CRA and Clearview runways. For the purpose of this Order, it is useful to describe the distance, on the ground, between the wind turbines and the runways. Because planes are constantly moving forward at relatively high velocities, it is also useful to describe the amount of time that a plane will take in travelling over these ground distances. As previously noted, different categories of planes fly at different velocities. As the evidence indicates that the vast majority of takeoffs and landings at CRA and Clearview are by planes falling in Category A or B, the Tribunal has chosen the start of the velocity range for Category B (120 knots or 61.73 metres per second). This velocity is also the fastest speed for Category A, so 61.73 metres per second is fairly representative for the majority of air traffic at both the CRA and Clearview runways. However, it must be recognized that the time to cover the ground distance will be longer for planes travelling at less than 120 knots per hour, and shorter for planes that travel faster. Using the distance legend on the map at Appendix 2 for the CRA runway, the shortest distance between wind turbines 1, 3, 4, and 8 and end of the runway (RN31) are in the range of 3,078 to approximately 4,000 metres. The time to travel 4,000 metres is 65 seconds. Wind turbine 5 is approximately 4,500 metres from the end of the runway, and wind turbine 6 is 5,000 metres away, so the respective travel times are 73 seconds and 81 seconds. Using the distance legend on the map at Appendix 3 for the Clearview runway, wind turbines 1, 3, 4, 5, 6, and 8 are all located within 1,500 metres from the end of the runway (RN16). The time to travel this distance is 24 seconds. Wind turbines 7 and 2 are, respectively, almost 2,000 and 3,000 metres from the other end of the runway (RN34). The travel times, respectively, are 32 and 49 seconds. The safety concern expressed by Mr. Elwood, and the other Appellants, relates to the proximity of all 8 wind turbines to the takeoff, transition and approach surfaces for the Clearview runway. Evidence provided by Messrs. Duncan and Hutton provides additional information regarding the distance between each of these wind turbines and the notional centre line of the approach surfaces at each end of Clearview runway. This centre line can be thought of as a notional line extending the runway from both ends. The following table provides the shortest distance between each wind turbine and the Clearview runway centre line, together with the amount of time, in seconds to travel this distance (fractional numbers are rounded upward), assuming a velocity of 61.73 metres per second. As Appendix 3, and the above data indicate, wind turbines 1 and 3 through 8 are all in close proximity to the centre of the Clearview runway. In particular, wind turbines 3 and 7 fall within the 5 diameter hazard zone (462.5 metres) for wind turbulence. As it was the opinion of all expert witnesses, who opined on turbine wake, whether they were called for the appellants or the respondents, that there was an unacceptable safety risk where turbines are located within 5 rotor diameters from the centreline approach, the Director can no longer support the locations of turbines 3 and 7 as currently approved. The Director takes no position on whether this evidence meets the test for serious harm to human health. The issue the Tribunal must address is whether the Appellants have, on a balance of probabilities, established that the Health Test has been met. It is not disputed that the harm, if it occurs, would be due to: (i) injuries sustained if a plane collides directly with a wind turbine; or (ii) a crash, resulting from collision with a wind turbine, or loss of navigational control due to the positioning of the turbines or due to wind turbulence produced by a wind turbine. There also is no dispute that the harm would likely be serious, in that it would likely result in serious physical injury or death. Therefore, the central issue in this proceeding is whether such harm will occur due to the proposed locations of the Project’s eight wind turbines. is not lessened because of the severity of the harm that will occur. As noted in Erickson v. Ontario (Director, Ministry of Environment),  O.E.R.T.D. No. 29 (“Erickson”), in addressing causation, the Tribunal may consider the cumulative and synergistic effects of multiple direct and indirect impacts. The first step is to determine whether the Health Test has been met, when assessed in light of the current existing operations at CRA and Clearview. In previous renewable energy appeal decisions, the Tribunal’s analysis has typically conjointly considered both the evidence respecting harm and the ameliorative impacts of proposed mitigation. However, based on the evidence and submissions of the parties in this proceeding, the Tribunal considers that its analysis will be clearer if the Tribunal first considers whether the Health Test has been met in the context of the current operations at CRA and Clearview. If the Tribunal finds that the Health Test has been met, the Tribunal will then consider the impact of the Approval Holder’s proposed mitigation measures. Mitigation measures may be implemented at a project site on lands within the management and control of an approval holder. However, the Approval Holder’s evidence respecting mitigation measures, other than implementing the lighting requirements set out in the CARS, relates solely to operational changes at CRA and Clearview, which are not within the Approval Holder’s control. The Approval Holder cannot force CRA or Clearview to change their operations. However, the wording of the Health Test makes it clear that whether the Project will cause serious harm to human health is not limited to geographical or property boundaries. Therefore, in determining whether harm will occur, the Tribunal will consider whether operational mitigation measures implemented at the CRA or Clearview aerodromes would reduce the likelihood of harm, irrespective of whether CRA or Clearview would agree to implement such measures. the risk that such harm will occur, it will achieve neither if it is not implemented. Whether a mitigation measure is feasible must be determined on the facts of each individual case. For example, a mitigation measure that would require CRA or Clearview, or the pilots flying there, to operate in contravention of the CARS, which is federal law, cannot be implemented, and, therefore, is not feasible. As well, a mitigation measure that would require error-free piloting is unlikely to be implementable, and, therefore, is not feasible. In this proceeding, a great deal of evidence was adduced regarding the federal aviation regime, more specifically, the requirement to avoid obstacles within the zone described as the obstacle limitation surface. Although it is acknowledged that this requirement is mandatory only for airports, the Appellants emphasize that this requirement should, nevertheless, be considered by the Tribunal, as it represents safe practice and is recommended by Transport Canada to be applied to all aerodromes. While minimum safety measures have some relevance, it is, nonetheless, important to note that regulatory authorities, in this case Transport Canada and NAV CANADA, may suggest or impose higher restrictions, even where the risk of harm is low, because they consider it is prudent to do so as a safety measure. … in this case, the Tribunal must make findings respecting the Health Test, which is very specific. It must be shown the serious harm will occur. Hence, the regulatory policies, in and of themselves, are not evidence that harm will occur, unless they are based on other supporting evidence which indicates that harm will occur. In such circumstances, it is the supporting evidence that would be probative, not the policy itself. The Tribunal received no evidence to suggest that the requirements of the federal aviation regime meet the stringent standard set out in the Health Test. Consequently, while safety requirements in the federal aviation regime may be indicative that harm may occur, they are, in and of themselves, not conclusive that harm will occur. O1. The Company shall retain an independent aeronautical consultant who has not represented the Company and was not involved in any of the studies submitted as part of the Application. The independent aeronautical consultant shall recommend mitigation measures that, given the presence of the Equipment included as part of this Approval, and the governing Canadian Aviation Regulations (CARs) and Standards, will enable Collingwood Regional Airport and Stayner (Clearview Field) Aerodrome to fulfill their duties related to safety [emphasis added]. The Approval Holder submits that the impact of wind turbulence would also be considered under this condition: Moreover, the impact of wake turbulence, if any, would necessarily be considered in connection with the development of mitigation measures under Condition O of the REA which measures, as discussed above, the Tribunal must take as given in the course of its analysis under s. 145.2.1 of the EPA with respect to engaging in the Project in accordance with the REA. The Tribunal accepts that engaging in the Project in accordance with the REA necessitates consideration of all the conditions of the REA. However, for the following reasons, the Tribunal does not accept the Approval Holder’s submission that the Tribunal must “take as given” that effective and feasible mitigation measures will be developed. If the requirement to mitigate the impacts of wind turbulence is to be determined and addressed in accordance with Condition O1, this will only occur if and when the Director’s decision to issue the REA is confirmed. Hence, the net effect of this interpretation is to preclude the Tribunal from considering the impacts of wind turbulence, or any other risk of harm, in the context of determining whether the Health Test has been met. The Tribunal’s jurisdiction under s.145.2.1 of the EPA cannot be ousted in this manner. third party at some later date is clearly insufficient. Condition O1 may have some benefits in addressing aviation-related issues that arise in the future after completion of this proceeding, but it is not a sufficiently particularized measure that can assist the Tribunal when applying the Health Test in this appeal hearing. Once it is determined that certain events, if they occurred, would result in serious harm to human health, it then becomes necessary to determine whether such events will occur at some time during the 20-year lifetime of the Project. Regarding the scientific evidence, two main analytical approaches to the causation issue have emerged from previous renewable energy approval appeal decisions. They are described as a quantitative assessment and qualitative assessment. A quantitative assessment can generally be described as a statistical probability assessment of risk. This approach analyzes information and data on the frequency of an event in the past in order to establish the likelihood of the incidence of the event over time. If it is accepted that such past experience may reflect future experience, the probability of future events can then be predicted. A qualitative assessment is a subjective evaluation of risk based on personal, albeit professional, judgement. Such judgments include an evaluative analysis provided by qualified individuals based on their expertise, i.e. their training, education, and/or experience. However, it is important to note that such subjective evaluations must be supported by information and analysis. Persons possessing the requisite training, education, and experience have acquired knowledge and information over time which informs their conclusions. The Tribunal is to determine whether specified harms will be caused according to the applicable legal standard, which is a balance of probabilities. That standard is not the exact same standard used by scientists, statisticians or medical experts. The Tribunal will take its direction on determining whether the Appellants have proven that harm will be caused according to the legal concepts of proof and causation. In doing so, it will assess the scientific evidence and consider which approaches to causation and proof were used in that evidence. Therefore, the Tribunal will carefully consider the probity of the information and analysis provided in support of either assessment methodology. You would have to evaluate an astronomical number of scenarios to do it by the method of normal quantitative risk assessment. And one of the particular reasons why I say that in this case is we are dealing with pilot aircraft, so they’re under human control, and they can react to situations and that’s how they do, and that’s a problem that doesn’t relate itself to quantitative risk assessment very well. … specific opinion regarding the probability that serious harm will occur (i.e., its likelihood) is often much more useful than a general opinion that serious harm will occur. Generally speaking, less weight is given to an expert opinion that fails to set out the specific pathways used in reaching a conclusion in terms of data, assumptions, and analysis. The Director maintains that the issue in Ostrander was whether evidence on population numbers of a threatened species was required to prove harm, and takes the position that this is a different test than the test to be applied by the Tribunal in this proceeding. However, the Director provided no analysis to further explain this position. The Tribunal does not accept the Director’s interpretation. The Court, in Ostrander clearly found that it was within the Tribunal’s jurisdiction to rely on a qualitative assessment as an evidentiary base for its conclusions. A considerable amount of evidence was led respecting the issue whether the proposed placement of the wind turbines would have safety impacts when designing instrument approach procedures that must be approved for use by NAV CANADA before they are published for use by pilots. Mr. Simpson, Supervisor of Flight Procedure Design at NAV CANADA, testified that overall, NAV CANADA did not object to the proposed location of the wind turbines, as they did not affect instrument approach procedures maintained by NAV CANADA to the extent that accessibility to the CRA would be impacted beyond reason. Test. Mr. Simpson confirmed that NAV CANADA’s review of instrument flight approaches does not include assessment of circumstances where the flight does not conform with regulations, or emergency situations “such as could be induced by inadvertent Visual Flight Rules flight into meteorological conditions not suitable for application of Visual Flight Rules or an inability of an aircraft to maintain required altitude in the event of a mechanical failure.” The Tribunal notes that such flight circumstances are precisely the type of situations that other expert witnesses have testified in this appeal could lead to wind turbine collision or wind turbine-induced loss of navigational control. Furthermore, neither aerodrome has an air traffic control tower, so a pilot flying IFR would still need to confirm the location of other pilots flying in the circuit and ensure that the runway is clear. The Unicom radio system is available for this purpose, but its efficacy depends on the frequency by which other pilots broadcast their locations. Consequently, the Unicom still needs to be supplemented by maintaining visual contact with other pilots within the circuit. In addition, the vast majority of flights at both aerodromes (approximately 90 per cent for CRA) are conducted using VFR. In summary, the Tribunal notes that a qualitative assessment of whether harm will occur requires a practical consideration of the circumstances in which such harm could occur. In this case, the circumstances in which harm could occur include when pilots fly under VFR or must supplement their IFR flight visually. The Tribunal begins with the expert opinion evidence adduced in this proceeding by a climatologist, a public safety risk assessor and aeronautical professionals: engineers, pilots, risk assessors and safety specialists. A total of 15 experts testified, each providing extensive evidence. As noted earlier, the expert opinion provided is based on qualitative assessments. All experts provided a considerable amount of information and technical data to support their analyses and conclusions. Based on my experience, I foresee an accident at CRA due to the presence of turbines in the proposed locations. In particular, I believe that new pilots or pilots with limited familiarity with the CRA would be most susceptible to an accident involving turbines. I believe that the most likely scenario will include marginal or deteriorating weather, making an approach to CRA more challenging (although still within VFR guidelines). The presence of the turbines will complicate landing procedures including locating and tracking the turbines, moving above or around the turbines, or failing to track other aircraft using non-standard approaches. All of those issues can lead to pilot error. All of these hazards are exacerbated in moderate or deteriorating weather. Respecting Clearview, Messrs. Duncan and Hutton stated that the planned location of the proposed wind turbines removes the capacity of the safety system to absorb errors or adverse factors that can lead to accidents. They further noted that there will be little room for any error margins in an already accident prone system. Mr. Pereira stated that “[i]n my experience in over 200 accident investigations, it is clear that when inadequate margins for safety are present, accidents will occur.” This assertion was not disputed by any of the other experts who testified in this proceeding. appears premised on the assumption that such small margin of safety is adequate.” The Tribunal finds that these observations provide a fair characterization of this aspect of Mr. McDonald’s evidence. For this reason, the Tribunal accepts the evidence of Messrs. Duncan, Hutton, and Pereira to the extent that it conflicts with the evidence given by Mr. McDonald. Hundreds of thousands of flights per year are operated in North America safely every year by trained pilots operating under VFR conditions, without incident. And, as noted earlier, under VFR conditions it is the pilot’s responsibility for obstacle avoidance. However, this assumption is clearly wrong – pilots using Stayner [Clearview] aerodrome will face a myriad of factors that could lead to aircraft straying outside the specified approach and departure geometry that McDonald prescribes as being safe for installation of the wind turbines. Any accidental straying into the wind turbine area that is in close proximity to approach and departure paths during such events would have a high probability of causing a fatal accidental impact with the turbine blades or tower. The approach centreline is an imaginary line toward which a pilot aims. Pilots on approach are constantly adjusting and correcting, and the centreline is rarely maintained especially when hand-flying as all airplanes coming into Stayner would likely be. Given the very close proximity of the turbines (the closest turbine is approximately 300m from the centre of Runway 16 and less than 100m from the edge of the approach surface), it would take little error for an aircraft to be on a collision course with a turbine – a miscalculation, distraction, or an insufficient adjustment to a crosswind would do it. Given the proximity of the turbines, the pilot would have very little time to correct any errors. In a light aircraft at typical approach speeds (which vary between aircraft), the aircraft will cover 100m in a few seconds. Mr. Cormier expressed a similar view. The Stayner Airport [Clearview] cannot meet any aerodrome certification standard not because of the wind turbines but due to the man-made structures and trees close to the runway surface. Setting that issue aside, the turbines lie outside the balance of the obstacle limitation surface for this runway (transitional and approach/landing) making the wind turbines benign in so far as an aerodrome and runway classification is concerned. Regarding the trees and existing structures, Mr. Cormier testified that they do not impede access to the runway. In other words, in approaching the runway, once a plane descends to that low an altitude, it would be situated on the runway. Apart from this, Mr. McDonald clearly presumes that the proposed wind turbines are safe, simply because they meet regulatory standards. Whether the wind turbines lie outside the transitional and approach/landing surfaces is disputed by the Appellants. However, this is not a material consideration. The Tribunal has already observed that compliance with the regulatory regime is not necessarily indicative of whether the Health Test has been met. In terms of whether serious harm will be caused, the material question is whether the proposed locations of these wind turbines are too close to the runway at Clearview causing serious harm through collision with a wind turbine or the ground. It is clear that wind turbines 3 and 7 border on the boundary of the takeoff/approach surface. In focusing solely on the regulatory regime, Mr. McDonald has overlooked the impact of wind turbine-induced turbulence. As already noted, Dr. Cox agrees the locations of wind turbines 3 and 7 are unsafe and cannot be supported, which completely contradicts Mr. McDonald’s view that the proposed location of the wind turbines near the Clearview runway are “benign”. As noted above, Mr. McDonald observed that hundreds of thousands of flights per year are operated in North America safely every year by trained pilots operating under VFR conditions, without incident. However, in a proper risk analysis, one also has to consider the accidents that have occurred. For purposes of the Health Test, even one incident of serious injury or death would satisfy the Health Test. Mr. McDonald did not provide any data on the incidence of accidents or near accidents, whereas Messrs. Duncan and Hutton have. Mr. McDonald also stated that “[t]here are scores of examples where certified airports have the outer surface penetrated and mitigation measures are implemented”. He then cited, as examples, several airports that have obstacles, including wind turbines, or mountainous terrain, near the runway. The Tribunal finds this evidence to be of little assistance. First, there is no indication in his evidence that a standard similar to the Health Test was applied when approving the layout of these airports. Secondly, the evidence adduced in this proceeding underscores that an aerodrome’s risk profile includes a variety of factors: the type of general aviation traffic using the aerodrome, the volume of traffic, the experience level of pilots using the aerodrome, unique meteorological conditions, etc. In the context of applying the Health Test, therefore, one cannot assume that the experience at one aerodrome would be the same at another. Certainly, in this case, Mr. McDonald’s evidence did not provide a sufficiently detailed description of the profile of each airport to establish that they are, in fact, similar to the profile of either CRA or Clearview. Another theme is the rapidly changing weather near Collingwood with the presence of eight wind turbines. I have no reason to doubt that the lake effect snow squalls can turn a sunny day into a blizzard quickly. I would tend to think however that the conditions that create this phenomenon are well known – wind blowing over the lake towards Collingwood, open water, cold land mass, etc. Therefore, while the weather can change rapidly it is also predictable with the appropriate conditions. The wind direction must be key, short term variable that triggers this phenomenon. The lake is either open or not but it is the wind direction that causes it to suddenly occur. This analysis does not accord with the evidence given by the climatologist, Mr. Mawson. Mr. Mawson’s evidence indicates that lake-effect storms occur when a confluence of meteorological conditions occurs: air and water temperature, as well as wind direction. Also, Mr. Mawson’s evidence indicates that, although climatologists can forecast which counties will experience such lake-effect snow storms, determining their exact location is almost impossible. This evidence does not support Mr. McDonald’s view that pilots flying at CRA and Clearview should be able to predict when a snow storm will occur at these aerodromes, and ignores Mr. Elwood’s uncontradicted evidence that such storms occur unexpectedly with very little advance signs of their on-coming approach. As such, Mr. McDonald’s view completely underestimates the safety risk associated with this meteorological condition. The Tribunal now turns to consideration of Dr. Cox’s evidence. Dr. Cox, who testified on behalf of the Approval Holder, is an expert in the area of risk assessment in public safety, energy and transport as well as fluid dynamics and turbulence. He acknowledged that he is not an expert in aviation matters and based his risk assessment analysis on the evidence provided by Mr. McDonald. In other words, he relied on Mr. McDonald’s outline of the relevant aviation considerations, and then conducted his risk evaluation based on these considerations. My expertise in this regard is as a mathematical modeler of risks, but I do not claim expertise or knowledge of all of the systems or activities that I am asked to analyse. Therefore, in response to this type of request it is my practice to collaborate with other experts with specific experience and knowledge of the industry sector in question. In this case, the Legal Counsel to WPD have instructed Mr. Ed McDonald P.Eng. who is an expert in the field of aircraft navigation and operations. I have had the opportunity to read his Witness Statement. adverse weather conditions, mechanical malfunctions, etc.). His analysis and conclusion was formulated in response to these concerns. In addressing his analysis and conclusion, the Tribunal first notes that Dr. Cox’s analysis is contingent on acceptance of Mr. McDonald’s position that the wind turbines would not create an obstacle under normal VFR flight. However, this is the central issue to be determined in this case. As will be discussed below, the Tribunal does not accept Mr. McDonald’s position, and, consequently, the Tribunal cannot rely on Dr. Cox’s opinion that the wind turbines themselves would not create an obstacle to air navigation. … if such a contingency [i.e. main safety risk factors] were to result in an aircraft coming within 150 m of the ground and off-course by at least 765 m, then I consider that the accident is likely to happen in any event and the presence of the wind turbines will make no difference to that. Even if an airborne contingency is the cause of an aircraft being at 500 feet in altitude, this would not inevitably result in a fatal crash. Depending on the circumstances, which are too numerous to mention, an aircraft may be able to recover and return to a higher altitude, or it may be able execute a landing in the nearby fields – so long as a nearly 500 foot turbine is not in the way. On the other hand, if a light aircraft were to collide with a turbine in the air, the obvious result will be catastrophic and fatal. Mr. Pereira also criticized Dr. Cox’s assertion, stating “[i]t appears that Dr. Cox assumes that for an aircraft to stray off course either the pilot or the aircraft must be so incapacitated that a fatal crash is inevitable.” The Tribunal further notes that Dr. Cox’s assertion involves, to a considerable degree, assumptions regarding aircraft navigation and operations, which he has acknowledged are not within his field of expertise. The most significant disturbances caused by a wind turbine wake is in its axial direction and manifested as a velocity deficit in the downwind region. Although the wake vortices also caused disturbance velocities in the radial and vertical direction, they are smaller than the axial disturbance velocity. Dr. Cox also relies on studies conducted by a consulting firm, GL Garrad Hassan, to conclude that it would be appropriate to designate a zone that is a distance equal to 5 rotor diameters (approximately 500 metres) downwind of the turbines as representing the part of the wind turbine wake that should be avoided by aircraft. (See GL Garrad Hassan: Advanced wake model for closely spaced turbines (American Wind Energy Association, 2005) and GL Garrad Hassan Canada, Inc.: Preliminary Turbulence Intensity and Wind Analysis at the Proposed Wainfleet Wind Project (800532-CAVA-T-01 Issue C, 29 August 2013). It is Dr. Cox’s opinion that there is no risk that the turbulent wakes from the wind turbines will affect flight operations at the CRA. However, he only provided a cursory description of his analysis in support of this conclusion. The Tribunal understands his analysis is as follows. As the wind turbines are designed to turn their blades to face into the wind, the turbulence wake will flow downwind behind the turbine blades. In a standard left-hand turn, where the circuit is located south of the runway, a plane will fly on the downwind leg towards the face of the turbines. Therefore, if a plane is at an altitude of 500 feet above ground, or lower, it would still not encounter wake turbulence because the turbulence zone is behind the turbines. Stated another way, the plane would encounter the wind turbine itself before it reached the turbulence wake behind it. If a plane’s altitude is high enough to fly over the wind turbines, it will not be exposed to the horizontal turbulence Dr. Cox has described. The Tribunal accepts this analysis as it relates to flying a standard circuit. However, the Tribunal does not accept Dr. Cox’s opinion that there is no risk at all from the turbulent wakes at CRA. As Mr. Hatcher posited in his evidence, if a pilot flew a wider circuit and a longer downwind leg to avoid the turbines, and then turned to the base leg, the plane could be located behind the wind turbines. There is also the situation where a pilot, for whatever reason, is not flying the circuit and navigates behind the wind turbines. There is agreement that the turbulence generated by wind turbines dissipates the further the turbulent air trails from the wind turbine. In the studies discussed by the experts who testified in this proceeding, there is disagreement whether the hazardous part of the wind turbulence trail falls within horizontal distance of 5 rotor diameters, or 10, or more. However, all the experts in this proceeding agree that the trail up to 5 rotor diameters is hazardous. They also agree that research in this is area is relatively new and is still evolving. As discussed in greater detail below, the Tribunal finds that serious harm will occur if it is assumed that the hazardous zone of the wind turbulence trail extends to 5 rotor diametres. Consequently, it is unnecessary to consider whether the hazardous zone extends beyond this distance. For this reason, and because the research in this is area is relatively new and is still evolving, the Tribunal makes no further finding on this particular issue. Regarding the impact of wind turbine turbulence at Clearview, Dr. Cox initially concluded in his witness statement that “[t]he wakes of the nearest wind turbines will be dissipated to levels that are safe at the location of the Clearview runway, even in the most adverse wind directions.” However, in cross-examination, he agreed that turbulence horizontally extending 5 rotor diameters from wind turbines 3 and 7 would penetrate the take off and flight approach surfaces, and, therefore, he could not recommend placement of those wind turbines in their proposed locations. As you may be aware, there are numerous articles and studies available regarding the effects of turbulence caused by wind turbines. In February 2011, Transport Canada participated in the “Aviation Safety-risk Assessment of The Effect of Wind Turbines on General Aviation Aircraft”, which was included within one of your attachments. The Summary 3.4 concluded: “The safety-risks associated with GA [General Aviation] aircraft operating in very close proximity to wind turbines – in particular, light and ultra-light aircraft – during take-off and landings from aerodromes, are assessed to be from low to moderate significance. The remainder of the safety-risks to GA [General Aviation] aircraft are assessed to be very low.” Several strategies to mitigate the hazards and risks were discussed in this document. The Director did not provide any further submissions regarding how risks characterized as “low to moderate” should be interpreted for purposes of applying it to the Health Test. The Tribunal has already found that the determination of risk depends on case specific factors. The Tribunal notes that the Aviation Safety-risk Assessment referenced in the Transport Canada letter was not adduced in evidence in this proceeding. If any of the parties sought to rely on this Assessment they could have done so. Consequently, the Tribunal is unable to evaluate the degree to which this Assessment would apply to the specific circumstances at the CRA or Clearview, or how the findings of this Assessment are to be interpreted in the context of the Health Test. between aircraft and wind turbines. The only evidence of Dr. Cox that the Tribunal has accepted is that wind turbine induced turbulence does not pose a risk for pilots strictly flying a standard circuit pattern at CRA. The Tribunal now turns to the evidence of the Appellants to evaluate whether they have established that the Health Test has been met. For the following reasons, the Tribunal finds that they have. The Tribunal begins by re-iterating that evaluating risk in the circumstances of this case necessitates a qualitative analysis. The most probative consideration presented in the Appellants’ analysis is that, where a margin for error is inadequate, there is a reduction in the capacity of the safety system to mitigate the consequences of errors or adverse factors that can lead to accidents. The evidence did not indicate that the margin for error can be quantitatively measured, so it must be qualitatively assessed. The evidence indicates that aviation is highly regulated industry, with particular emphasis on risk management. This industry has operated for decades, and the Appellant’s safety experts indicate that, when inadequate margins for safety are present, accidents will occur. The Tribunal finds, therefore, that the question to be answered in this case, is whether, in introducing the wind turbines at their proposed locations, the margins for error are adequate. 8. This time consideration, in and of itself, considerably narrows the margin of error, even under standard flight circumstances. The Tribunal’s next observation is that the proposed wind turbines are to be located in the runway environment, where a pilot’s options for navigation are restricted to the required circuit pattern. The flight take off and approach protocols, further narrow the pilot’s options as to where he or she can navigate. The greatest concern for the CRA, aside from the fact the proposed wind turbines would be situated along the circuit path, is the vertical distance between the circuit height (1,000 feet) and the top of the wind turbine (500 feet). This distance is only 500 feet. Mr. Hatcher’s analysis indicates that the tolerance for altimeter error is 200 feet, and that pilots can pass their skill demonstration if they are with 100 feet from a given altitude. This means a plane, under normal operating circumstances, could only be as far away as 200 feet from the wind turbines. In addition, local air pressure changes could result in inaccurate altimeter readings. Apart from this, pilots flying VFR are required to remain 500 feet from the cloud ceiling. If the cloud ceiling is lower than 1000 feet, this will also reduce the distance between the plane and the turbines, which further reduces the margin for error. It is also important to note that pilots flying under VFR are, during the day, required to remain 500 feet from any obstacle. However, the Appellants have led extensive evidence how pilot error, including errors in maintaining the correct altitude, can and do occur, and so pilots do not always comply with this requirement. Although the analysis is qualitative, such analysis may include quantitative evidence. The likelihood that an activity will result in harm will, in most cases, increase as the frequency of the activity occurs. In this case, there are approximately 13,200 movements (take offs or landings) that occur each year at the CRA and it is anticipated by CRA staff that this activity will increase. Therefore, over the 20-year life span of the Project, there will be at least 264,000 movements at the CRA. Dr. Cox also provided a quantitative analysis of the predominant wind direction at Collingwood. Utilizing five years of hourly wind speed and direction observations from the CRA, he created a wind rose diagram which indicates that winds at Collingwood are predominantly from the north-west. In order to take off and land into the headwind blowing in this direction, planes would travel the runway in the RN31/13 direction, which, in turn, means, that they would be predominantly flying the left-hand circuit south of the runway and near to the proposed wind turbines.  conditions resulting in a pilot flying very near the wind turbines;  pilot inexperience, which would lead to a pilot requiring more time to recognize and respond to a hazard; and  the volume of plane traffic at the CRA, which increases the likelihood that a hazardous situation could arise. Considering all the above factors, the Tribunal accepts that the margin for error posed by introducing the proposed wind turbines at their proposed locations would be inadequate to prevent collision with a wind turbine. For this reason, the Tribunal accepts the opinions of Mssrs. Cormier, Hatcher and Mr. Gascoine that serious harm will occur. lead the Tribunal to conclude that likelihood of such harm can be reduced. This step is discussed below, but the Tribunal first turns to the application of the Health Test to current operations at Clearview. In terms of time, all the turbines, with the exception of wind turbine 2 are 15 seconds or less from the runway centerline at Clearview. The Tribunal has already rejected Mr. McDonald’s opinion that placement of the eight wind turbines in relation to the Clearview runway are “benign”. Dr. Cox agrees that the proposed location of wind turbines 3 and 7 are unsafe and cannot be supported. The Director has accepted this evidence and no longer supports the proposed placement of these two wind turbines. The Tribunal has also rejected Mr. McDonald’s opinion that the visual approaches and departures along the approach and departure path at Clearview are safe, provided an aircraft does not stray west of the runway centerline. The Tribunal has accepted Mr. Pereira’s evidence that pilots rarely maintain flight on the centre line, and that it would take little error for an aircraft to be on a collision course with a turbine due to a miscalculation, distraction, or an insufficient adjustment to a crosswind. In this regard, the Tribunal further notes that, even if wind turbines 3 and 7 were removed, straying west of the runway centreline could also bring a plane within the 5 diameter turbulence zone of any of wind turbines 1, 4, 5, 6 and 8. In light of Mr. Pereira’s evidence, the Tribunal finds that the margin for error is inadequate. In addition to these concerns, the Tribunal notes that many of the other safety factors cited above regarding CRA also apply to Clearview. that its greater distance from the runway does not decrease the risk of harm that it presents to any significant degree. In this regard, the Tribunal notes that wind turbine 2 is only 31 seconds from the runway centreline. Its proximity to the left-hand circuit path is considerably less than 31 seconds. For these reasons, Tribunal accepts that the margin for error posed by introducing the proposed wind turbines at their proposed locations would be inadequate to either prevent collision with a wind turbine, or prevent a crash due to wind turbineinduced turbulence. The Appellants’ experts each have provided an informed and reasoned evidentiary base to support their qualitative assessment. Therefore, the Tribunal finds that the Appellants have established, on a balance of probabilities that the Health Test has been met as it is applied to the current operations at Clearview. As with CRA, the next step, therefore, is to determine whether the mitigation proposals proposed by the Approval Holder would lead the Tribunal to conclude that likelihood of such harm can be reduced. (3) maintain a standard left-hand circuit for RN13/31, and a nonstandard right-hand circuit for RN31/13. This would place the circuit path on the north side of the paved runway irrespective of the runway direction. The bottom line is that there is tremendous flexibility to move the circuit to the circumstance. Many airports have unique issues that result in nonstandard circuits – Collingwood is not unique in this respect. The key is this information being promulgated in the appropriate publication. It is clear, therefore, that Mr. McDonald maintains his position that, as pilots are required under the CARS to inform themselves of the traffic pattern at an aerodrome and avoid obstacles, that his proposed measures are safe. However, he does not otherwise provide any analysis evaluating their impact on safety, more specifically, whether these mitigation options would reduce the likelihood of harm occurring at the CRA and Clearview aerodromes. In response to the first and second proposed mitigation measures, Mr. Cormier stated: … The assumption that the circuit will be a perfect rectangle is wrong. The specific path of a circuit is quite variable as it can depend on winds, weather conditions, ceiling, clouds, obstructions, air traffic ahead and on the runway, and pilot experience. Thus it can be expected that any circuit, be it wide, long, short, or tight, will vary by any type of aircraft under different conditions and piloting styles. There is no line on the ground to guide the pilot, and he must adjust to circumstance. Standard practices promote safety, and any variation introduces risk. Finally, established circuit patterns on the north side of the runway for both runways 13 and 31, and also the turf runway, would cause proximity to the turbines when aircraft join the circuit from the south, as they must still overfly the aerodrome and could easily come in proximity to the turbines. Two different circuit directions to the same runway introduce the potential for head-on collision on the final turn. Such an arrangement would not be supported by Transport Canada. In addressing these proposed mitigation measures, the Tribunal must address whether they are feasible. Options 2 and 3 both require implementation of a right-hand circuit pattern. However, as previously noted, under the CARS, which is federal law, not a merely a policy guideline, a right-hand circuit can only be implemented with approval of the Minister of Transportation. There is no such approval in place for either Clearview or CRA and neither aerodrome operator has indicated that they intend to apply for such approval. The aerodrome operator could request a right hand circuit pattern be published for runways 19 and 31 to avoid the obstacles. Such procedures would have to be approved by Transport Canada. There is nothing in this wording to indicate that Transport Canada recommended a right-hand circuit. As previously noted in this Order, no other evidence was adduced in this proceeding to indicate that a right-hand circuit would be approved by the Minister of Transportation, as required under Part 602.96 of the CARS. Having found that the Health Test has been met in respect of both CRA and Clearview, the Tribunal cannot simply assume that the Minister’s approval would be given, nor can the Tribunal evaluate the proposed mitigation measures by deciding itself that a right-hand circuit is acceptable. The reason for this is obvious. If the Tribunal were to confirm that the Director’s decision to approve the REA, based on an assumption that a right-hand circuit would be implemented, the Project could proceed, notwithstanding that a right-hand circuit may never be approved. Consequently, the Tribunal finds that mitigation options 2 and 3 are not feasible as there is no indication that a right-hand circuit will be approved by the Minister. In further support of this finding, the Tribunal relies on the evidence that, although right-hand circuits are not unsafe per se, they are less safe than a left-hand circuit, which better maximizes a pilot’s field of view. Therefore, a right-hand circuit does reduce, to some degree, a margin of safety in VFR flight. Also, the Appellants’ evidence is that the use of standard procedures promotes safety. Introduction of a right-hand circuit is non-standard procedure, which also reduces to some degree, a margin of safety in VFR flight. Consequently, it is not surprising that: (i) there is a legal requirement to obtain the Minister’s approval before a right-hand circuit can be implemented; and (ii) only three to four per cent of aerodromes in Canada have received approval for a right-hand circuit. The evidence adduced in this proceeding does not address whether the Approval Holder could apply for approval of a right-hand circuit. If, indeed, only an aerodrome operator can apply for the Minister’s approval, the Tribunal recognizes that the Approval Holder would be prevented from presenting mitigation options that require the implementation of a right-hand circuit. However, as previously noted, neither the Approval Holder, CRA or Clearview can control the use of another person’s property. In the alternative, even if the evidence was that a right-hand circuit could be implemented, based the Tribunal’s acceptance of Mr. Cormier’s evidence above, the Tribunal finds that none of the mitigation options proposed by Mr. McDonald would significantly reduce the likelihood of a collision with a wind turbine. As this proposal includes implementation of a right-hand circuit, the Tribunal first notes that its analysis regarding the feasibility of implementing a right-hand circuit equally applies to Clearview. Consequently, the Tribunal finds that, on this basis alone, Mr. McDonald’s mitigation proposal for Clearview is not feasible. In the alternative, even if the evidence was that a right-hand circuit could be implemented, the Tribunal, for the following reasons, finds that this proposal would not significantly reduce the likelihood of a collision with a wind turbine, or ground crash caused by wind-turbine induced turbulence for all wind turbines other than wind turbine 2.
runway. However, the runway is part of a right-hand circuit. The Tribunal has already found that the Health Test has been met, based on the proximity of wind turbines 1, 3, 4, 5, 6, 7, and 8 to the Clearview runway. As such, the introduction of a right-hand circuit does not address any of the harms that led the Tribunal to find that the Health Test has been met in respect of these wind turbines. The Tribunal also notes that its analysis of the impacts of introducing a right-hand circuit on the margin of error in VFR flight, apply to Clearview as well. Consequently, the only harm that Mr. McDonald’s proposed mitigation would address is with respect to wind turbine 2. The Tribunal has found that the likelihood of harm associated with this wind turbine is its proximity to a left-hand circuit path on the east side of the runway. As Mr. McDonald’s proposed mitigation would restrict circuits to the west side of the runway, the likelihood of this harm would be mitigated. As the Tribunal has found that the Health Test has been met in respect of the current operations at CRA and Clearview, and that the Approval Holder’s proposed mitigation measures in respect of both aerodromes will not significantly reduce the likelihood that such harm will occur, or, if there is some reduction in the likelihood of harm, the reduction is not to a degree that would result in the Health Test not being met, the Tribunal finds that the Appellants have met their onus to establish that the Health Test has been met in respect of the Project’s effects on persons using both aerodromes. The Appellants allege that the Project will cause serious and irreversible harm to bats through collision mortality. It is not alleged that harm will occur through disruption or destruction of bat habitat. Although the Appellants allege harm to all bats, the Appellants’ evidence focuses on three endangered bat species in Ontario: little brown myotis (also known as “little brown bat”), northern myotis, and eastern small-footed myotis. a. Dr. Shawn Smallwood, on behalf of the Appellant, Wiggins, was qualified to give opinion evidence as an ecologist with experience in avian wildlife behaviour and conservation; b. Dr. Brock Fenton, on behalf of the Appellant, Wiggins, was qualified to give opinion evidence as a biologist with expertise in bat behaviour and ecology; c. Ms. Sarah Mainguy, on behalf of the Appellant, Preserve Clearview Inc., was qualified to give opinion evidence as an ecologist with expertise in wildlife surveys and impact assessment, including bats; and d. Dr. Scott Reynolds, on behalf of the Approval Holder, was qualified to give opinion evidence as an expert on bats and the impacts of wind energy projects on bats. The Director did not call evidence on this issue. The evidence indicates that there are eight bat species that are present in Ontario. Five of these species are seasonal hibernators. These species spend their active season on the landscape and are inactive in underground hibernacula during the winter months. Two of these hibernating bat species, the little brown myotis and the northern myotis, were listed as endangered under the ESA in 2013. The eastern smallfooted myotis and tri-colored bat are also listed as endangered under the ESA. In Ontario, there are also three species of migratory tree bat. They spend their active season on the landscape and migrate south each autumn. None of the migratory tree bat species is listed as at risk provincially or nationally. As noted by Dr. Reynolds, the seasonal hibernators have seen population declines throughout the eastern United States and Canada due to an invasive fungal disease known as White-Nose Syndrome (“WNS”). WNS has eliminated approximately 80% of the hibernating populations of bats in the northeastern United States, including over 70% of the little brown myotis and up to 98% of the northern myotis populations. In Canada, within the region of the Project site, Dr. Fenton suggested that WNS has eliminated 90% to 95% of the little brown myotis population. It is predominantly the impact of WNS on these bat populations that led to their listing as endangered under the ESA. young) are generally found in buildings and other human structures, although they will use large trees as well. Data collected by Dr. Fenton in Ontario suggest that little brown myotis are more commonly found in areas with buildings than areas without buildings. Little brown myotis, like all other bats in Ontario, are nocturnal. They feed (i.e. forage) at night on insects. Little brown myotis generally fly at less than 2 metres off the ground, but may fly higher, when commuting from their roosts or when foraging. They generally forage within 1-2 km of their daytime roosts and are commonly found foraging over open water rather than over field or forested habitat. Dr. Reynolds pointed out that historically, little brown myotis were widespread across most of Ontario. Regarding the northern myotis, Dr. Reynolds stated that they have many of the same ecological preferences as the little brown myotis, although they show a stronger preference for forested habitat. Northern myotis are relatively uncommon in southern Ontario and tend to be more active in forested habitat than in agricultural habitat. Similar to little brown myotis, the distance between their summering range and wintering area is highly variable and dependent on the availability of suitable hibernacula. Northern myotis generally use relatively large decaying trees for maternity colonies and often change roost trees throughout the summer. They tend to rely on one or two primary roost trees surrounded by multiple alternates within their home range. They generally commute very low to the ground and avoid crossing open habitat, but may forage within or above the tree canopy to capture insects. Regarding eastern small-footed myotis, Ms. Mainguy stated that like other hibernating bats in Ontario, this species has likely suffered population declines due to WNS. She stated that eastern small-footed myotis were very rare in 1993 when the Atlas of the Mammals of Ontario (Federation of Ontario Naturalists, 1994) was prepared and is likely very rare now. She stated that the current population of the species is unknown. survive their first year, but those that do survive may live for more than 30 years. Dr. Fenton stated that these realities mean that their populations are vulnerable to additional fatalities and their populations grow extremely slowly. The Approval Holder did not undertake pre-construction acoustic surveys of bats at the Project site. However, its Natural Heritage Assessment and Environmental Impact Study, dated January 2012 (the “NHA”), lists, at Appendix C, little brown myotis and northern myotis as wildlife species that are present in the region and, at Appendix B, includes, based on the Approval Holder’s records review, northern myotis as a species of conservation concern at the Project site. It does not identify little brown myotis or eastern small-footed myotis as potentially being specifically present at the Project site or of conservation concern generally. Ms. Mainguy asserted that it is likely that little brown myotis and northern myotis, and possibly eastern small-footed myotis, occur at the Project site. She stated that on two occasions during visits to the Project site, she identified little brown myotis there. Citing the Atlas of the Mammals of Ontario, Ms. Mainguy gave evidence that little brown myotis and eastern small-footed myotis have historically been present in the Project area. She testified that bats, including, in her opinion, little brown myotis, likely roost in buildings in the vicinity of the Project. She stated that she identified guano in the attics of buildings in the vicinity of the Project, which she identified as being consistent with being from little brown myotis. She also stated that she visually identified little brown myotis on two separate occasions at locations in close proximity to the Project. Dr. Reynolds and Dr. Fenton agreed that, in respect of the little brown myotis, there are likely some of these bats in the area. … it is unlikely that a large resident population currently exists on the Project site. That is primarily due to the lack of maternity roosting structures within the Project site and the fact that the dominant habitat within the Project site and the adjacent area is not the preferred habitat for this species. Furthermore, in general across Ontario, little brown myotis are not nearly as abundant on the landscape as they were previously due to the impacts of WNS. Dr. Fenton suggests in his Witness Statement that little brown myotis are at 5% – 10% of their preWNS population levels within the region. He believes that although little brown myotis are likely present in the Project area, their numbers are low. In response, Ms. Mainguy stated that numbers of bats in a given area are highly variable, depending on insect abundance and habitat. She pointed out that the little brown myotis lives anywhere that trees and water are found and, noting that she has observed this species at the Project site, it is suitable habitat for this species. Dr. Fenton stated that the exact sizes of bat populations are unknown, but that little brown myotis populations in parts of Eastern Canada have been reduced dramatically in recent years. Regarding whether endangered bats are present at the Project site, Dr. Fenton, Dr. Reynolds and Ms. Mainguy agreed that there are likely some little brown myotis there. Regarding the presence and population of the other endangered bat species, there was no agreement among the experts. trees and will not be located in prime bat habitat. He stated that the Project site does not have significant attractants for bats. The habitat throughout the study area was composed of interspersed streams, small woodlands, ponds and wetlands (amongst agricultural fields) that would provide foraging habitat for bats. In addition, there were reasonably abundant dead trees and many old buildings in the area that in my experience could support roosting bats. Referring to the Atlas of the Mammals of Ontario, Ms. Mainguy’s evidence is that eastern small-footed myotis and little brown myotis have been recorded at the Project site and northern myotis have been recorded in the region in the past. She noted however that eastern small-footed myotis have not been reported there recently. She questioned the comprehensiveness of the site investigation conducted by the Approval Holder’s consultant, Stantec, to identify bat hibernacula and roosting sites and the presence of endangered bats in the vicinity of the Project. She stated that Stantec’s surveys for bat maternity colonies did not use protocols recommended by the Ministry of Natural Resources and Forestry (“MNRF”) and important habitat was overlooked. The NHA states at page 3.13 that the Approval Holder’s search for bat roosting sites was confined to within 120 metres of Project infrastructure and did not include searches of buildings. The Tribunal notes that the wildlife assessment notes prepared by Stantec, indicate that trees with cavities were found to be “abundant” in woodlot 2 and “occasional” in woodlots 1 and 5 in the study area, but that no bat habitat was identified. Ms. Mainguy testified that further investigations should have been completed. She also reiterated that the Approval Holder failed to conduct acoustic surveys to determine the presence of bats at the Project site. suitable little brown myotis habitat and likely roosting sites in very close vicinity of the Project site. Given the evidence before the Tribunal that little brown myotis typically forage within 1-2 km to their daytime roosts and reside in areas close to trees and water, their likely roosts have been identified and at least one individual recently sighted in the vicinity of the Project area, and as agreed by Dr. Fenton, Dr. Reynolds and Ms. Mainguy, the Tribunal finds that it is more likely than not that there is a small population of little brown myotis at the Project site and its vicinity. Regarding the presence of northern myotis and eastern small-footed myotis at the Project site, no evidence was presented to the Tribunal of roosting sites or of these species being recently sighted in the vicinity of the Project site. Although there is evidence that the trees and wetlands in the area could be habitat for these species, the Tribunal has insufficient evidence to conclude that northern myotis or eastern small-footed myotis more likely than not are present. It seems unquestionable from the evidence that was placed before the Tribunal that there was a risk of serious harm to Blanding’s turtle from the project. Given the fragile status of Blanding’s turtle as a species, it would be difficult to characterize any increase in mortality arising from the Project as anything other than serious. The real issue is whether that harm was also irreversible. The Tribunal has addressed the issue of whether impacts on bats constitute serious harm in several past decisions. Although concerns were dismissed regarding bat populations in Bovaird, Fata, Lewis and PECFN, the Tribunal views the circumstances in the present case as distinct from those in past Tribunal decisions. Since those decisions, the species has continued to decline. The witnesses agreed that Little Brown Bat populations have declined quickly and precipitously due to White-nose Syndrome. The Tribunal accepts Dr. Fenton’s opinion that incidental bat mortality will occur with the Project and that this would be scientifically significant for Little Brown Bat, when considered at a local scale. Dr. Strickland did not disagree that incidental mortality will occur, but stated that the numbers will be small. With only 5 to 10% of the historic population remaining, the Tribunal finds that an increase in mortality of even small numbers of Little Brown Bat constitutes a serious impact. This case is distinguishable from the White Pines project in Hirsch both because of the disparity in the evidence of harm to bats and the proposed turbine curtailment mitigation measures discussed above. The unique pro-active curtailment mitigation measures to be deployed from the outset of the operation of the Project are an encouraging development for the protection of bats. The Tribunal finds, based on the evidence heard, that a large proportion of potential bat mortality will be addressed as a result of this mitigation. will cause serious and irreversible harm to bats, including Little Brown Myotis, Northern Myotis, and Tricolored bat species. Dr. Reynolds summarized research that he conducted 10 years ago in New Hampshire on little brown myotis. At that time, he found that the little brown myotis population in New Hampshire was growing slightly. He analyzed the population impacts post-WNS and what the likely effect of fatalities from it would be, given the recovery potential of the population. He stated that his study showed that short of a plateauing of effect, regionally there would be a “quasi-extinction of this population in 16 years”. However, he also stated that more recent data shows that a plateauing effect may indeed presently be occurring and that some little brown myotis populations are stabilizing at about 3 to 5% of their pre-WNS levels. The evidence before the Tribunal includes records from Bird Studies Canada that show until recently, dead little brown myotis were consistently found at wind energy facilities in Ontario and in fact that the species was consistently one of the bat species with the highest mortalities in the province. Dr. Fenton testified that such evidence confirms that little brown myotis are susceptible to collisions with wind turbines. Since 2010, the number of dead little brown myotis found at these sites has declined, likely reflecting their dramatic drops in population. However, the Tribunal finds that the Bird Studies Canada evidence demonstrates that little brown myotis are susceptible to wind turbine strikes and, given the presence of little brown myotis at the Project site, the Tribunal finds that the Project will cause little brown myotis fatalities over the lifespan of the Project. Dr. Reynolds stated his opinion that serious harm is harm that is “biologically significant”. He stated, in terms of biologically significant harm, the important question is whether the operation of the Project will in any way alter the slope of the population trajectory of endangered bat species. Dr. Reynolds observed that there is no evidence that the level of mortality to little brown myotis at wind energy facilities has in anyway accelerated the rate of decline or lowered the rate of recovery of this species. He also stated that the current level of mortality to this species from wind energy facilities in general is incidental, and is not biologically significant. He concluded, therefore, that any foreseeable fatality of this species at the Project site would not cause any serious, let alone serious and irreversible harm. With populations so critically low, it is likely that any additional mortality would eliminate breeding adults that have survived white nose syndrome, which would be critical to the persistence of the population. In her evidence, she further stated that the remaining breeding adults have survived WNS and could potentially carry resistance to it and that, therefore, their protection from harm is critical to any possible recovery of the species. She testified that the introduction of a known source of mortality into an already critically low population of little brown myotis would have a high probability of causing serious harm to the species. She stated that the population of little brown myotis is “catastrophically small” and any further bat deaths would harm the local population. Dr. Smallwood opined that the species cannot tolerate any more fatalities and Dr. Fenton testified that the species has become more vulnerable in the past three years and that any further mortality will hasten local extinction of the species. Although he stated that, without knowledge of species population sizes, “we cannot appreciate or describe the impact of mortality at wind farms”, Dr. Fenton testified that there are endangered bat species of bats in the area which are vulnerable and “will surely be seriously and irreversibly harmed by the development in the absence of robust amelioration actions”. Dr. Reynolds agreed regarding the vulnerability of the species, predicting that unless local population levels plateau, the little brown myotis will be regionally extirpated by 2026. As noted above, he added that there are now indications that some local populations are starting to plateau. Given the fragile status of Blanding’s turtle as a species, it would be difficult to characterize any increase in mortality arising from the Project as anything other than serious. The Tribunal notes that the “endangered” status of little brown myotis categorizes this species as more at risk and with a more fragile status than the “threatened” Blanding’s turtle referred to in Ostrander. local population of little brown myotis present at the Project site, is consistent with the purpose of the EPA to provide for the conservation and protection of the natural environment. Given the vulnerability of this species and the likelihood that the Project will cause fatalities, the Tribunal finds that without adequate mitigation measures, the Project will cause serious harm to the local population of little brown myotis. In Amherst Island, the proponent committed to undertake preventative mitigation measures to reduce the risk of harm to endangered bat species. In its Mitigation Operation Plan, dated November 2015, supplementing the renewable energy approval, post-construction monitoring was increased beyond that required under the impugned renewable energy approval for the periods of highest risk to endangered bat species, precautionary blade rotation cut-out in low wind conditions were required for times that these species are active, and there would be increased curtailment of operations in instances where there are additional bat fatalities by raising the wind speed at which turbines would commence operation. … it would be irresponsible not to use any feasible approaches to mitigate the impact of wind turbines on populations of [little brown myotis]. Failure to mitigate will effectively jeopardize the long term survival if this species by causing local extirpation. evidence that bat fatalities are often under-estimated by post-construction monitoring. This fact is also noted in the EEMP. Proposed mitigation for mortality of endangered bat species due to wind turbines would not be effective, as excessive mortality would not be detected until the end of each year, potentially after considerable mortality of adult breeding bats had taken place. Breeding adults are likely to be extremely important for populations of endangered bat species, as they are individuals that have survived white nose syndrome: the only individuals that could potentially carry resistance to the fungus. In addition there is no evidence that thresholds that have been set for acceptable bat mortality at each turbine would be sustainable in the long term for endangered bat species, especially considering the context of cumulative impacts of wind turbines throughout Ontario. The Tribunal notes that unlike in Amherst Island, neither the REA nor any supplementary commitments made by the Approval Holder require that preventative mitigation measures be implemented from the outset of the Project’s operations in order to reduce the harm that the Project will cause to endangered bat species. Under Condition I5 of the REA there must be 10 bat fatalities of any species per turbine for mitigation measures to be triggered. Although endangered species fatalities must be reported to MNRF, such circumstances do not trigger any mandatory mitigation measures under the REA. Based on the evidence before the Tribunal regarding the vulnerability of the local little brown myotis population at the Project site, the Tribunal finds that, on a balance of probabilities, this high threshold for triggering mandatory mitigation measures will not prevent serious harm being caused by the Project to the local little brown myotis population. Approval Holder regarding possible impacts on this endangered species caused by the Project’s operation. The Tribunal notes that the NHA was conducted in 2012 prior to the listing of little brown myotis as an endangered species under the ESA and that the NHA does consider little brown myotis as a species of conservation concern. Condition J1 of the REA requires that the Approval Holder ensure that Project activities requiring authorization under the ESA will not commence until the necessary authorizations are in place. The Tribunal notes that the issuance of such authorizations does not necessarily address the issues that the Tribunal must consider under s. 145.2.1 (2) of the EPA. Given that no such authorizations have been issued, it is not possible for the Tribunal to assess whether such authorizations in this case would mitigate impacts of the Project to little brown myotis or specifically address the threat of extirpation of the local population of this species. In Amherst Island, the Tribunal found that bats were known to forage in the vicinity of the wind energy project and that there was suitable habitat there to support their life processes, but there was insufficient evidence to determine that there would be fatalities or, if there were fatalities, that they would be at a level that would cause serious and irreversible harm. Like in Amherst Island, the population of little brown myotis at the Project site is small; however, in the present case, preventative mitigation measures are not in place equivalent to those set out in the supplementary commitments made by the approval holder in Amherst Island. In Amherst Island, the Tribunal found that the approval holder’s commitment to preventative mitigation measures ensured that bat fatalities, if any, would be minimal. The Tribunal finds that the mitigation measures as set out in the REA are not as protective as those in the supplementary commitments made for the wind energy project in Amherst Island, which the Tribunal finds are more up-to-date and consistent with the environmental protection and conservation purposes of the EPA. The Tribunal notes that if similar measures were put into place for the Project, the Tribunal may have found that harm would be reduced below the threshold of serious harm. Given the evidence before the Tribunal on the presence of little brown myotis in the vicinity of the Project site, the history of fatalities of this species at Ontario wind facilities, and the absence of progressive preventative measures to reduce the risk of harm to this endangered species, the Tribunal finds that engaging in the Project in accordance with the REA will cause serious harm to the local population of little brown myotis over the lifespan of the Project. The test under s. 145.2.1(2) requires that the Tribunal determine both whether a project will cause serious harm and also whether it will cause irreversible harm. As noted by the Court of Appeal in Ostrander, data on population numbers are helpful for determining whether a population can recover from harm, but where such data is not available, the Tribunal may rely on expert opinion in making this determination. In the present case, the Tribunal has determined that little brown myotis is present at the Project site and the species is in danger of extirpation. Dr. Fenton stated that population data on little brown myotis in Ontario does not exist, but he and Dr. Reynolds agreed that its population in Ontario has been reduced by 90 per cent and that the local population in the vicinity of the Project site is small. It therefore stands to reason that the number of little brown myotis fatalities that will be caused by the Project will be low. Dr. Reynolds stated that any foreseeable bat mortality at the Project site would not cause any irreversible harm. He stated that any incidental mortality caused by the operation of the Project would not alter the slope of the population trajectory of little brown myotis and is therefore not irreversible. The impact of WNS jeopardizes the long term survival of some species of bats, to the point that any additional mortality (e.g. at turbines) is not acceptable from a conservation standpoint. Our lack of knowledge about the size of the populations of different species of bats precludes specifically quantifying the risks turbines pose to the long term survival of populations of bats. Populations of [little brown myotis] appear to be about 5 – 10% of their pre-2010 levels. Additional mortality, such as that associated with wind turbines, will jeopardize the survival of this species which has been so negatively affected by WNS. Ms. Mainguy stated that increased mortality of breeding adult little brown myotis would likely cause irreversible harm to the local population of this slow-reproducing species. She stated at page 7 of her “Report on Peer Review of Fairview Wind Farm: Endangered Bat Species”, which was appended to her witness statement, that “[m]ortality of breeding adults would likely result in irreversible harm to the local bat populations in the vicinity of the wind turbines”, reiterating at page 10 that “[b]reeding adults are likely to be extremely important for populations of endangered bat species, as they are individuals that have survived white nose syndrome: the only individuals that could potentially carry resistance to the fungus”. impacts on the local population of little brown myotis will decrease its chances of recovery over the lifespan of the Project. The Tribunal finds that over the lifespan the Project, it is more likely than not that the Project will cause serious harm to the local population of little brown myotis from which it will not recover and cannot be reversed. Therefore, without additional mitigation measures in place, the Tribunal finds that engaging in the Project in accordance with the REA will cause irreversible harm to little brown myotis. Based on the evidence before it, the Tribunal finds that engaging in the Project in accordance with the REA will cause serious and irreversible harm to animal life, plant life or the natural environment under s. 145.1(2) of the EPA. I also agree with the Divisional Court that, given the broad and varied range of attacks launched against the REA, it was not realistic to expect the parties to address the appropriate remedy at the end of the hearing of the merits without knowing what the Tribunal’s findings were in regard to the broad range of alleged harms. Without the contributions of the parties on the question of remedy, it is not surprising the Tribunal found itself “not in a position” to consider the full range of remedial options. opportunity for the parties to make further submissions on appropriate remedies, should the Approval Holder or the Director request such an opportunity. The Tribunal, therefore, adjourns this proceeding to a telephone conference call (“TCC”) to determine the next steps in this appeal, to be scheduled by the Tribunal Case Coordinator. In order to ensure that there is sufficient time to hold a remedy hearing before the statutory deeming provision takes effect, the Tribunal adjourns this proceeding, pursuant to O. Reg. 359/09, s. 59(2)1.ii, effective from the release date of this Order, to the date of the next scheduled TCC. The Tribunal finds that the Appellants have satisfied the health test and the environment test in respect of little brown myotis under s. 145.2.1(2)(a) and (b) of the EPA. The Tribunal, therefore, allows the appeals in part. Subject to any further order of the Tribunal, this proceeding is further adjourned under s. 59(2)1.ii of O. Reg. 359/09 to a telephone conference call to be arranged by the Case Coordinator. At that time, if a remedy hearing is required, the Tribunal will discuss procedural steps for the hearing of submissions with respect to the appropriate remedy, pursuant to s. 145.2.1(4) of the EPA. If there is an attachment referred to in this document, please visit www.elto.gov.on.ca to view the attachment in PDF format.